An Arabic letter handwritten by Father Khouri Youhanna Elias on June 21, 1910. It confirms the baptism of Alesabath daughter of Elias alSabbah on June 21, 1894. An Arabic letter handwritten by Father Khouri Elias alHadsheti. It confirms the birthdate of Madeline Kalil on March 25, 1894. A letter, written on July 15, 1910, certifying that Namatallah Wakid Jameyl was born on July 12, 1894. Handwritten letter in Arabic. Provided translation shows it was written July 2, 1904 by Father Anatolios Haddad to confirm that Afifi Barouki, daughter of the late Ibrahim Al Barouki, was baptized on August 21, 1894. An Arabic letter handwritten by Father Khouri Gabreil al Afeesh on March 29, 1910. It confirms the birthdate of Olga daughter of Mousa al Aqal on January 2, 1894. "Olga Moser" is written on the bottom in pencil. A certificate in Turkish (Ottoman). ID record/certificate. Year of birth 1894. 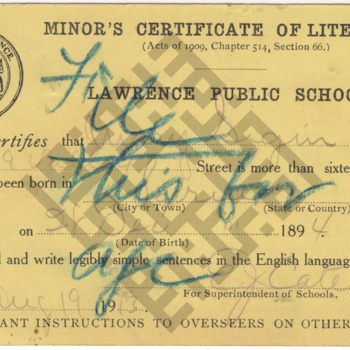 Issued on February 9, 1903. An Arabic letter handwritten by Father Khouri Mousa Marhaj on November 15, 1909. It confirms the baptism of Shukri Qiami on November 19, 1894. A letter from Arlington Mills composed on November 11, 1913 explaining a complicated situation detailing different records and employments for Michael Kalil, which provide contradictory evidence for his age. An application for employment certificate for Abdo Kalil to work at Pacific Mills for G. M. Towers, filed on October 25, 1912. It lists his residence as 353 Commerce St., birthplace as Syria, and birthdate as 1894.